These past few weeks, I have been planning my trip to California this summer. 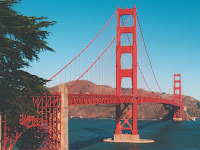 I will spend a few weeks in San Francisco, Redwood National Park, and the mountains. I am incredibly excited about this trip! So. I thought now is the time to share some of my tips about planning. I researched activities using the search engine, goodsearch. Every time you search, money goes to the organization of your choice. Great idea! I suggest the charity for curing autism. When searching, I look up fun activities, places to go, hotels, and restaurants. Then, I print out pictures of different places, so I can have a visual of my trip. I put together a booklet, which is helpful to look back at. A poster makes a great display, too. The best part of planning is that you look forward to your trip, even if it is months away. I know I can't stop thinking about mine! It is early to start planning, but it is always better to be prepared and have your affairs in order. Enjoy these tips and happy planning!